Everyone's heard of the Applicant Tracking System (ATS) that nearly all employers are using to filter through the piles and piles of resumes they receive, however, not all job seekers know how to use this technology to their advantage. If you've ever applied to a position that you are well qualified for and receive an automated rejection email less than 24 hours later, chances are your resume failed the ATS scan. Without the right keywords in your resume, your document may never make it to the HR Manager's desk. The keywords section (commonly known as Core Competencies) is a critical part of a successful resume and fits right in with your Title and Summary on the top half of your first page. To create a Core Competencies section, gather around 10 buzzwords/key phrases that highlight your skills and areas of expertise and arrange them in a visually appealing way (remember, a human will be reading your resume after the ATS does). Don't know which keywords to include in your Core Competencies section? Look no further than the job ad itself. 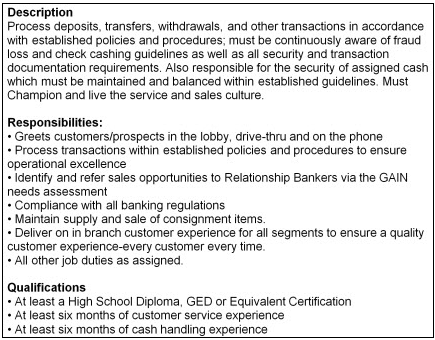 Take a look at a posting for a Teller position with Capital One below. Use the job posting you apply to as a guide for which keywords to include in your Core Competencies section and throughout your resume. For example, keywords from the above posting could be: customer service, needs assessment, regulatory compliance, cash handling, supply management, transaction documentation, etc. 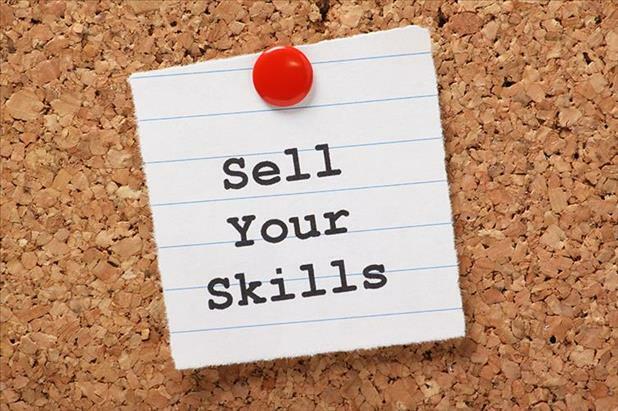 And, of course, be sure all the keywords you include on your resume are skills you actually have – if there's a skill in the job ad that you can't confidently defend, leave it off. Remember – the ATS scans your entire document, so don't be tempted to create a 100-keyword core competencies section to make sure you have all of your bases covered. You must appeal to both the computer AND the human eye. The first example is that of a Keyword Section in a professional resume. 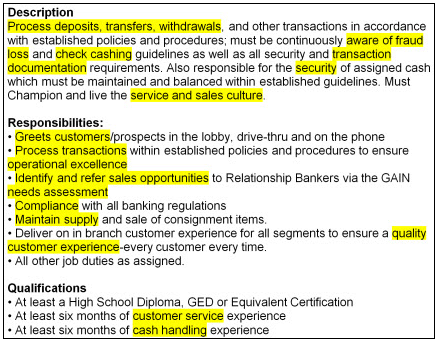 Below that is an example of a job ad that is advertising for a Teller position with Capital One. Look at the example below that, can you spot the keywords this employer will scan for?